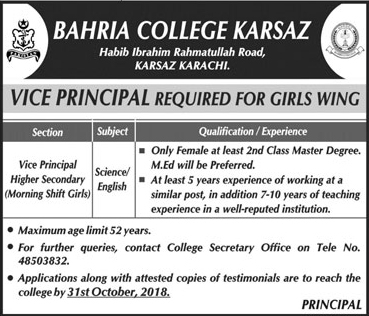 Bahria College Karsaz Karachi Sindh. • Only Female al least .d Class Master Degree, M.Ed will be Preferred. • At least 5 years experience of working at a similar post, in addition, 7 - 10 years of teaching experience in a well-reputed institution. • Maximum age limit 52 years. • Applications along with attested copies of testimonials are to reach the College by October 31, 2018. • For queries, contact College Secretary Office on Tele No. 021-48503832. Habib Ibrahim Rahmatullah Road, Karsaz, Karachi.